It's that time again! Invite a friend and come to 14 Hours of Chaos lock-in on March 1-2. We'll meet at the church at 7:00pm for more wild attractions, amazing music, crazy amounts of sugar, and all your friends! Bring $15 and a sleeping bag & pillow. Pick up at 9:00am. This event is open to all 5th & 6th graders and we encourage you to invite your friends to come. RSVP by February 27. 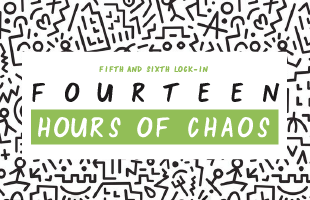 14 Hours of Chaos is an overnight event put on by Christ Kids, designed for grades 5 through 6. We would love to invite you to be a part of this event by serving with us! There is no cost to register and signing up is easy, just use the link below and choose the area you would like to serve in. Group Leader: As a group leader, you will help lead a group of 10 to 12 kids through the entire event. Group leaders will serve from Friday at 6 p.m. to Saturday at 9 a.m. From worshipping and group time to games and staying up way too late, it’s going to be a great night you don’t want to miss! Crew Member: Make 14 Hours of Chaos happen by serving behind the scenes. Crew members will serve Thursday from 6 to 8 p.m. and/or Friday from 6:00 p.m. to midnight. Opportunities to serve include helping with check-in, security, transportation, breakfast and more. Register today to serve with us!